First and foremost, props to the Grand Prize winner, Sef Churchill and her wildly imaginative story, “Porthole.” She should write her own (legitimate) version of this post. But my Honorable Mention was included in the “Congratulations to the Winners” email – and I call that #WINNING! So here’s how I did it, and how you can too. Learn David’s Story Secrets Now, FREE! When the contest was announced, I decided that I wanted to win. After serving as a judge in the Winter Short Fiction Contest (also hosted by The Write Practice and Short Fiction Break), I decided to take a crack at writing a story for the Spring Contest. After judging so many stories, I needed to refresher. It got easy to think of myself as a pretty awesome storyteller when one I was busy critiquing other people’s work, and I worried that I was getting both rusty and cocky. So I took a look at the contest theme, “Person in a Hole,” and got to work. I planned around the Theme. As a former contest judge, I remembered that my fellow adjudicators and I often rejected a story because it failed to clearly embrace the Contest Theme. And I use that word very intentionally: CLEARLY. Some stories tried to find clever little ways to squeeze the theme in – perhaps the author reengineered an existing piece to fit the theme, slapping it on like a cheap band-aide. You have to build from the ground up with the Theme as your concrete foundation. It has to be integral to your story’s every element. The Theme must be core. So that’s what I did. I began with the knowledge that my protagonist would have to end up in a jam and get herself out of it. The question, then, was how. Prior to establishing any characters or goals, I made a decision. I wouldn’t put my protagonist in just 1 hole. I wanted to go 3 layers deep: A Person in a Hole, in a Hole, in a Hole. In other words, I wanted the story to have a feeling of constant descent, with the characters endlessly crawling their way back up. To begin this “descending” feeling, I chose a Time and Place (setting) that immediately resisted my protagonist’s goals. She began as an outcast and fugitive. There was nowhere safe for her. Thankfully I had two characters ready to go: Celestine and Winnie, a mother and daughter who are fleeing from a South Carolina plantation in the 1830s. Beginning a story with your characters already in a Hole goes a long way to hooking your reader with immediate high stakes. To relieve herself and her weary daughter of this oppressive setting, Celestine chooses to find shelter in a rumored Underground Railroad station, but at great risk to herself and her daughter. Its owner is ambiguously unfriendly and his motives murky. When he offers the women his own room for them to sleep in and then shuts the door, I wanted the reader to question the entire situation and feel trapped there with Celestine and Winnie. It was just another step of the descent, lowering the heroes into their own version of Hell’s pit. Notice the numbers on the left side of the page – I drafted with these 3 levels in mind. The finished story differs from this plan, but wouldn’t exist without the plan. Sure enough, a slave hunter comes calling. In early plans and drafts, I had Winnie (the daughter) escaping into a crawlspace beneath the house while Celestine was interrogated/tortured by the nameless hunter. But this felt weak, and my instincts were right. Since Celestine was my protagonist, and she was the one descending deeper and deeper into the pits of Southern Slavery, she had to be the one to fall the deepest. So she does, escaping in the nick of time but trapping her daughter with the hunter. Stuck beneath the floorboards, her daughter at the mercy of a cruel individual, Celestine has to think quickly in order to save her child. In highsight, I’m grateful that I planned the story’s structure with this “Hole within a Hole” device in mind. Not only did it allow me to strictly adhere to the theme, but it provided a structural framework for my earliest drafts. Get the Coaching You Deserve! After a few drafts, I had a story I felt proud of. Before sharing it, I subjected it to my own storytelling criteria for success, which you can use too. Just download my free writer’s resource, The 10 Reasons Readers Quit Your Book (and How to Win Them Back!). But thanks to The Write Practice, all contest authors were granted access to Becoming Writer and required to workshop their stories prior to submission. No artist can survive in a vacuum. None of us is strong enough on our own to catch every error or spot every storytelling misstep. It was amazing. I received so much helpful feedback (including help cutting over 600 words from the manuscript!) and was blessed to provide feedback to others. For a story to find success among a wide readership, it must be rigorously workshopped. When the email from Joe Bunting finally came, I opened it was a thunderous heartbeat. I wanted to win, and I had made it my goal to write a story that could get the job done. And like so many other authors, I’d been waiting more than a month to learn my story’s fate. So when I saw “The Warmth of Blankets” as an Honorable Mention, I hollered like crazy and ran around the house until I found my shell-shocked wife, hugged the heck out of her, found my daughter, hugged the heck out of her, and then apologized for scaring the poop out of them with my shouting. So no, I didn’t win the Grand Prize (kudos, Sef!). Nor had I claimed a Runner-up position (way to go, KG and Gayle!). But out of hundreds of submissions, I won an Honorable Mention. So how can I be so thrilled to not be THE winner, so to speak? After my judging experience, I might as well have won the whole dang thing. Judging is terribly and painfully subjective. When I served as a judge in the Winter Contest, I worked with at least a dozen other judges scattered across the globe. Our deliberations consisted of emails that functioned more like sermons. I argued passionately for my favorites in the face of shocking disinterest from other judges (who were, of course, suggesting stories to which I expressed equal disinterest, no doubt causing them equal consternation!). It’s a flawed, human process. As a judge, getting one of my favorite stories onto the Honorable Mention list for the Winter Contest required me to directly email other judges, appeal for more time to deliberate, and even probably offend one or two other people who were (to their credit) done with me and my passion for “that” story. So to see my own story on the Honorable Mention list felt AMAZING. Because once you give the judges a stack of 10-15 great short stories, it’s anyone’s guess which one is “best.” Sometimes there’s a clear winner. Sometimes there are 3 clear winners. Maybe all 15 could claim the top prize. Even with a rubric provided by the contest coordinators, we still disagreed, and some judges probably viewed the list of winners with a bit of dissatisfaction. In the end, the results of a writing contest are up to the 15 opinionated, talented, wise, but flawed experts who serve as judges. There is no single authority on what is “best.” God Himself (or Herself) doesn’t appear to bestow approval upon the glorious One Story That Tops All Others. It’s beautifully and tragically subjective. For me, Honorable Mention is a handsome crown that I will proudly wear. I will gladly sit below Sef and KG and Gayle and enjoy my tiny, but honorable, spotlight. Because many, many more authors weren’t so lucky. Remember, you can learn the Story Secrets I used to craft my winning short story, “The Warmth of Blankets,” in my FREE new book, The 10 Reasons Readers Quit Your Book (and How to Win Them Back)! What do you think? Is there more to winning a short story contest? Your story was spellbinding entertainment. I live just north of the Mason-Dixon, in one of the focal points of the Underground Railway and my ancestors were abolitionists and they were a part of that enterprise. It rings true, with familiar emotions. The finished article was well done. Out of more-than-just-idle curiosity, would you be willing to let me (or anyone) see the story you submitted to “workshopping”? That is, in its pristine state resulting from your sole draft/rework process. I think it would be marvelously informative to those of us who are teetering on the edge of contests and the entire move out from our solitary realms to examine the work, in its intermediate stages. We see contest concept spelled out, and we see the winning entries, but we can only guess what it looks like in between. Since I try to build stories according to the storytelling principles I wrote about in my book (else I’d be a huge hypocrit! ), my story’s biggest problem at this point was flow and pacing. These elements are nearly impossible to correct on ones own, which is why I recommend (in this post) to rigorously workshop your story. 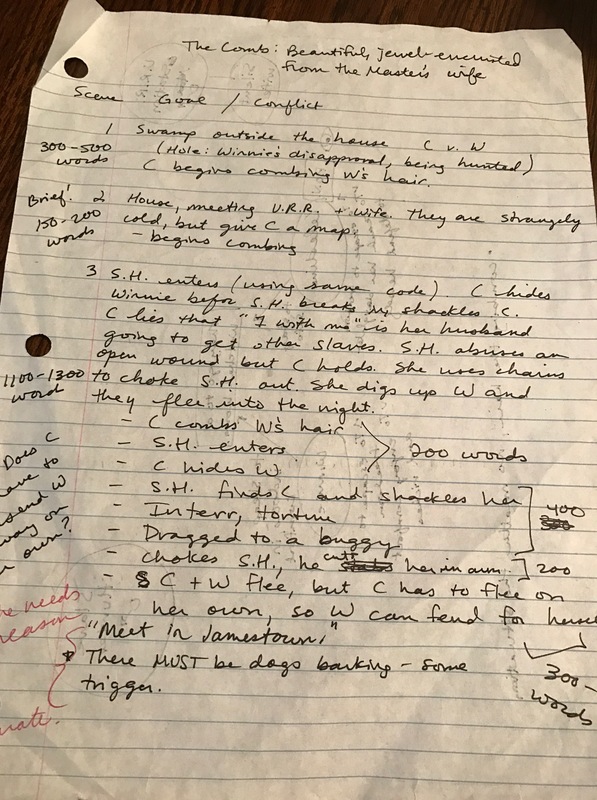 To be more specific about flow and pacing, some of the story’s key moments weren’t hitting right: In this draft, Celestine escapes through a trapdoor, which felt too convenient to the plot; the killing of the slave hunter was clunky, as was the girls’ escape; also, the ending didn’t land the way I wanted it to. As for how my drafting experience can help you and others, notice that I honed in on my story’s key beats or essential moments. Readers get a weird feeling when these moments don’t flow naturally in their mind – readers also don’t like it if they can’t visualize the scene like a movie as they read, too. While the story may be “good,” it will rarely rise up and become an “experience” that the reader becomes passionate about. To get this right, the story needs to have a balance of imagery and movement, and that takes both practice and, as I said, lots of feedback. Thanks to the Becoming Writer community, I got just that. So if you’re going to enter a contest, make sure it’s one of The Write Practice’s seasonal ones, as you get complimentary access to an entire community of writers who will help you get your story in shape. Reply with your email address (Gmail, preferably), if you want to see the original draft. Thanks again for the comment!